WORLDWIDE: Crime associated with wind projects is perhaps not the first thing a potential developer considers when looking to establish a wind farm, but it is becoming of increasing concern to some. The fact is that copper wiring from a single turbine can fetch a considerable sum of money. According to energy and mining consultancy Wood Mackenzie, a wind turbine holds 3.6 tonnes of copper per megawatt, and the metal is currently trading at $7,100 per tonne. Not all of that weight comes in the form of cabling, which is the primary aim of thieves, but even a 1.5MW has roughly $20,000 worth of copper cable. The true total value in terms of the black market price for stolen copper is hard to measure, and it varies across the world, but it is certainly enough to provide a powerful incentive for thieves, who are increasingly prepared to travel to remote wind farms to seek their fortunes. The costs of theft and vandalism to a project are difficult to predict as they are often random events, but wind farm that fall victim to such criminality can face significant downtime and expensive repair costs. Instances of copper theft and vandalism have increased significantly over the past two years, according to Park Insurance, a UK firm that specialises in covering wind projects. "We've definitely seen more claims recently," says Park's commercial manager, Mark Loud. "In one instance in the south of England, thieves used a pick-up truck to rip £12,000 of copper out of the ground." The downtime and cost of replacing the metal are not the only setback developers can suffer. In one example in New Zealand, thieves accidentally caused the spillage of 20,000 litres of coolant oil from two transformers during failed attempt to rip out the copper. And some of those involved have adopted a particularly brazen approach, with one incident recorded where thieves returned to strike again at a wind farm near Mansfield, England, only three months after first stripping £50,000 ($82,000) of cable from the site. Across India last year, there were about 140 cases of cable theft lodged with the police, compared with 56 in 2012. Last year also saw 193 people arrested on suspicion of involvement in copper theft from wind projects, and cable worth INR 9 million ($145,000) was recovered. Indeed, copper theft has become such an issue in Rajasthan, India, that the authorities have taken the unusual step of creating a specialist police unit to tackle wind-project crime. The Wind Dragons, are officers tasked with guarding approximately 2,000 turbines with a capacity of 2.2GW in the remote Jaisalmer district, near the border with Pakistan. Other measures are being adopted by developers to prevent crime at their sites, with most choosing to use at least security staff or advanced electronic systems. 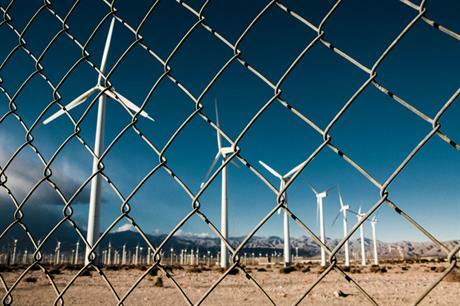 Experts suggest the best way to prevent theft and vandalism at wind farms is to develop a security plan before the start of construction, and maintain procedures during operation. Use of proper lighting, alarm systems, fencing, and deployment of security staff are as important during construction as they are during commercial operations. During construction, an assigned employee should be responsible for the routine inventory of materials, ensuring that high-value materials are properly recorded when brought on site and when they are used. One developer that has made concerted efforts to tackle crime at its sites during operation is First Wind. The US firm brought in IT security specialists Cisco, after its previous efforts using a variety of physical access control systems proved impractical. IT staff had to travel to each site every time employees' access privileges needed to be added or removed, and with a growing portfolio of projects, this method became unworkable. One of its large wind farms in Utah, for example, is a four-hour drive from the nearest airport. A centralised management system became a practical and cost-efficient option, and now First Wind can control access to exterior doors, substation doors and turbines from one central location. Doors remain locked at all times unless an authorised employee passes a card in front of a proximity reader. The company has also centralised video surveillance monitoring to accelerate incident response. Security officers at First Wind's two data-access-control centres monitor real-time video from all sites, notifying local staff if they see something suspicious. A more novel means of deterring copper theft, or at least helping recover the metal is through a technological development from wiring firm Southwire. Its Proof Positive Copper cable has a tin-coated wire in the centre strand that is laser-etched with a serial number unique to each foot of the wire, and a website URL. It is notoriously hard for metal recyclers to identify if copper has been stolen, so it is usually relatively easy for the thieves to offload. But with this wiring a potential purchaser can simply log on to the website and check if the copper has been misappropriated. Adopting some measures to protect projects becomes even more logical when the reaction of those insuring projects is taken into account. "Some insurers are demanding that wind-farm operators put some kind of security measures in place before they are willing to cover them," says Loud. "Projects where they use more-advanced digital surveillance will definitely be offered more competitive cover." Copper theft is not the only security headache for developers. In California, wind-farm operators have noted an increase in acts of vandalism carried out by those opposing wind development. Many of the incidents occur prior to construction, with a number on more vulnerable meteorological masts. A recent spate of attacks in southern California involved at least eight incidents in ten months, according to state police. With met masts costing between $50,000 and $100,000 each, these attacks can lead to costly losses. In the most dramatic incident, criminals hijacked a digger at night and ruptured an underground pipeline, spewing oil on to NextEra Energy Resources' Vasco repowering site in the Altamont Pass, California. Proper planning and engagement with the local population can also be useful. Bringing locals onside through consultation will decrease the likelihood of any anti-wind vandalism. And it will also guard against theft, with locals much more inclined to report suspicious activity around a development that they are happy to have nearby. The exceptionally conductive nature of copper makes it an essential element in wind turbines. Copper is required in the generator to help convert the wind's energy into electricity, which is then transmitted through copper cables down to the base of the turbine tower, where it passes through switch gear on the way to a transformer. The electricity from each turbine transformer passes through more copper cabling to a common collector. Copper is also used to ground wind turbines from lightning strikes, to which they are particularly prone. In addition to all this, copper wire is integrated within the rotor blades to dissipate the energy caused by static electricity build-up.